TURN is an add-on which you can purchase for your MICRO, SME or Professional AllyCAD software. If you would like more information before you purchase TURN for AllyCAD please email a Key Accounts Manager directly. 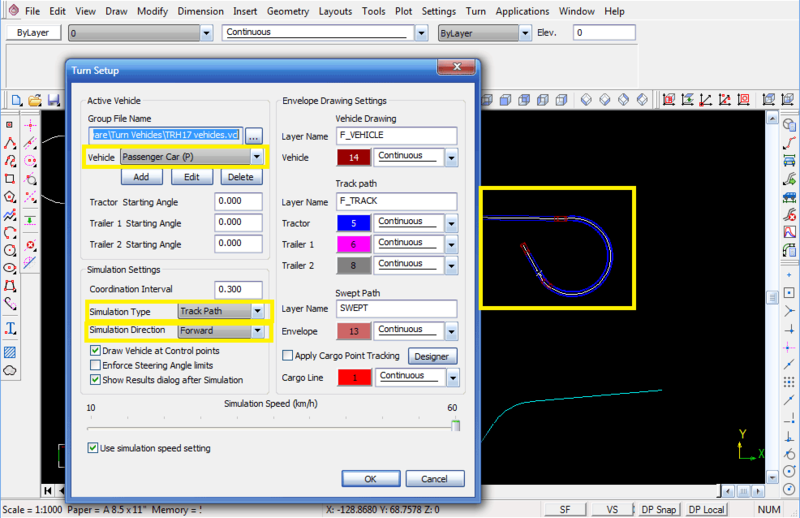 TURN provides dynamic and interactive simulation for low speed turning manoeuvres along a specified tracking path which includes cars, trucks, articulated vehicles, trailers, commercial aircraft and forklifts. 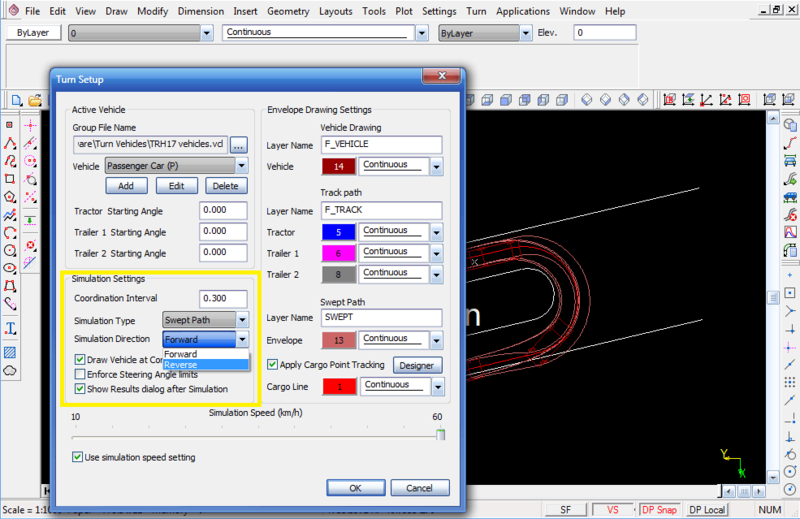 Easy track path definition and creation with smallest turning circle calculation. "Even when designing a shopping centre these days, you need to see where the trucks can turn to get in and out of the loading yards." "The Observatory Business Park was designed with the help of TURN. We wanted to ensure that the large delivery trucks could drive through the traffic circles of the business park with ease." 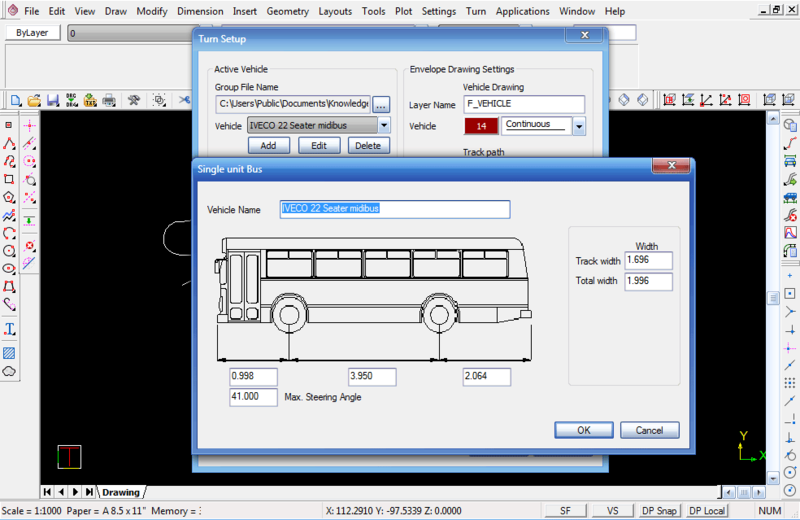 Vehicle Libraries are completely user configurable. Libraries for TRH 17 design vehicles and various aircraft are distributed with the program. You can create new libraries and add your own vehicles to the library by simply entering the dimensions for the new vehicle into a graphical vehicle dimension dialog. You can create new libraries and add your own vehicles to the library by simply entering the dimensions for the new vehicle into a graphical vehicle dimension dialog. 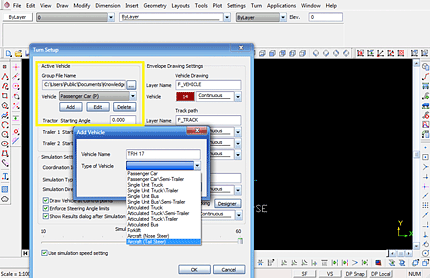 A full range of vehicle configurations is supported. Single unit vehicles include passenger cars, buses, trucks and forklifts. 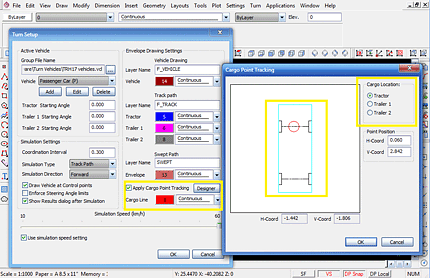 Trailer and semi-trailer combinations such as cars with trailers, articulated vehicles and interlinks are also supported as well as nose-steer and tail-steer aircraft. Indicate the starting position and direction and then graphically indicate a series of way points. 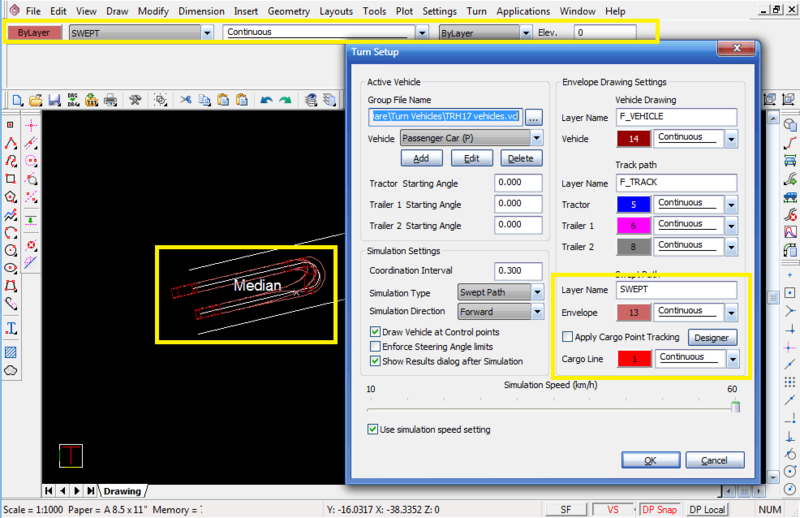 The vehicle will automatically move to the way points conforming to its minimum steering angles. To finish off your drawings you can place a vehicle profile, complete with dimensions, by simply selecting a toolbar button and indicating the position of the profile graphically. It has been designed for ease of use. You simply draw or select the vehicle path, select the vehicle for the simulation, and then specify either a forward or a reverse run to create the track or swept path envelope. 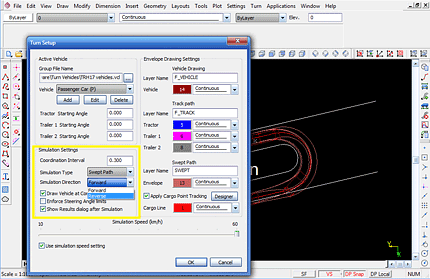 You can generate minimum turning envelopes by simply indicating a start position and an initial direction of movement. You can then drag the entire envelope to check critical sections of intersections, traffic circles and parking areas. 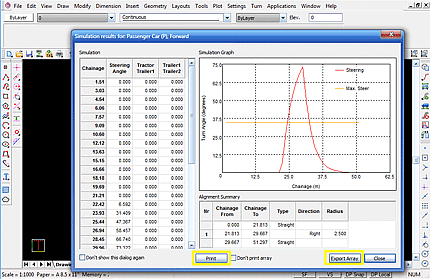 Additional points, within or beyond the vehicle's body, can be tracked using the Cargo Point Tracking function. This allows you to track the position of cranes, side mirrors or cargo extremes along the track path. 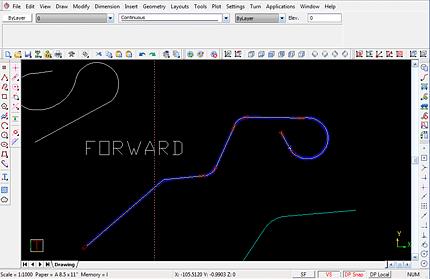 Forward and reverse movement for any of the supported configurations can be simulated along a specified track path. 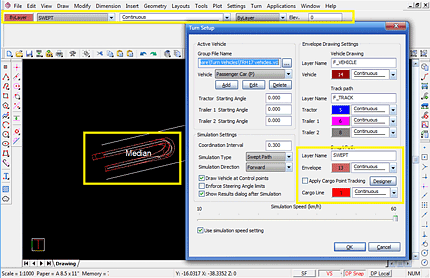 When a simulation is run, the path of the tyres can be displayed as a CAD layer. 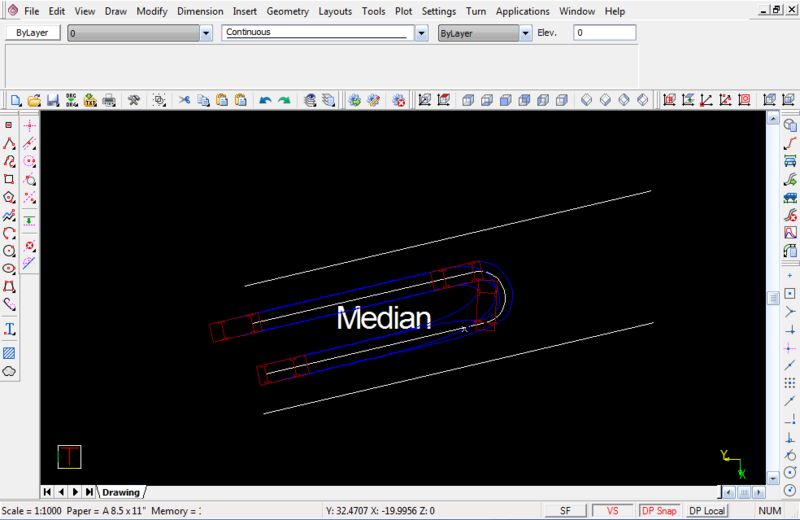 CAD lines can be used as tracking paths and other CAD entities can be used in conjunction with TURN simulation.